1 Listen to the words and expressions and repeat them after the speak'er. 2 Match the places /names with the short descriptions. Use your own knowledge when you can. a) is the home of the President and his family. b) is a group of museums. c) is the federal agency that investigates criminal matters. e) is the place where laws are passed. f) is a monument to the first President of the USA. g) is the President's wife. 3 Read the text and answer the questions. 1. What do the letters D.C. in the name of Washington, the city, stand for? 2. What state is Washington in? 3. The city stands on the Potomac river, doesn't it? 4. Is Washington or New York the capital of the country? 5. What about Washington surprised the friends? 6. Why is the level of pollution quite low in Washington? 7. In what building are the laws passed? 8. What is the address of the White House? 9. Did George Washington live in the White House? 10. Is there a monument to Lincoln in Washington? 11. What does the Jefferson Memorial look like? 12. What is the Smithsonian Institution famous for? Olga: Welcome to Washington, D.C. (1), my friends. The city stands on the Potomac River (2) and is bordered by the state of Maryland to the north and Virginia to the south. Misha: So what state are we in now? 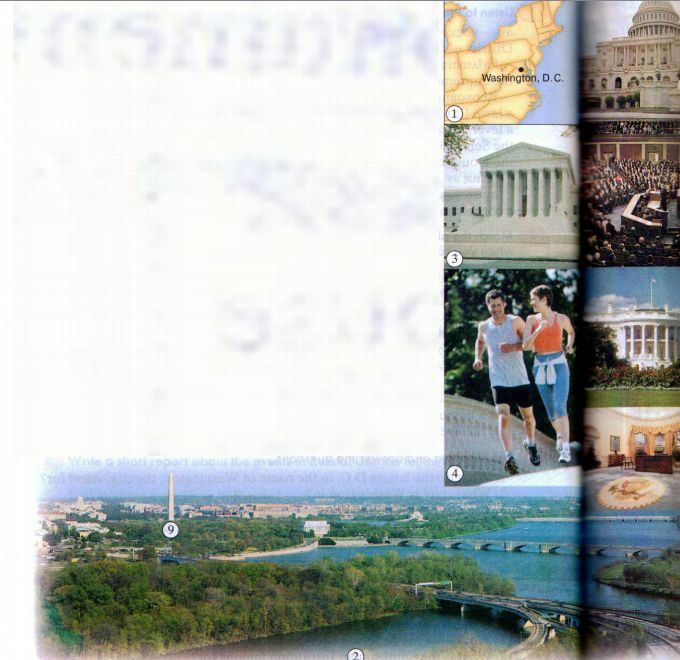 Olga: We're not in a state, Misha, but in the District of Columbia. That's what the letters DC in the name of the city stand for. As Washington is the capital of the country, it's not in any state in the United States. That's logical, isn't it? Olga: Washington is the home of all the government institutions for the whole country: Congress, the White House, the Supreme Court (3). All the foreign embassies are here too. Emily: I think you're right, Grandma. Mark: Look, everyone, the city is so beautiful! It doesn't look like a capital city at all. Olga: Yes, there's a lot of green here, so many parks and lawns. Wait until this evening when the whole city turns into a big fitness club. Everywhere people will be jogging (4), playing football or volleyball, or riding their bikes. The climate is not too severe here, although it can be too warm in the summer. Sometimes they even advise children not to go outside. Because government is the city's only industry, the level of pollution can be quite low, especially in the cooler months. Misha: That's really interesting! It's so different from Moscow, where we don't have nice weather very often. Rob: It's different from London too. In our capital city the level of pollution is so high that it's really horrible for people who go jogging in the streets. Olga: OK. I need your attention now, my friends. This isn't just another park we're passing. It's Capitol Hill, and the white building up there is the Capitol (5), where laws are passed. The Capitol has housed chambers of the Senate and the House of Representatives (6) for almost two centuries. The cornerstone of this impressive building was laid by George Washington himself. If you want to see it from the inside, we can go on a tour round. Emily: Oh, no, thanks. We don't have very much time here, so I think we'd prefer to see the White House first. Olga: Well, let's leave the car here then. The place we're looking for is world famous. It's the White House, 1600 Pennsylvania Avenue NW, Washington, DC 20500 . So if you want to write to the American President, now you know the address. Here we are. Look (7), isn't it beautiful? Mark: It's not as big as I thought it would be. Let's hurry! We want to go in. Olga: I'm sorry, my dear, but there are no regular tours of the White House. If you really want to go inside, you have to plan the whole thing well in advance and buy special tickets. Emily: Oh... I didn't know. But why? Olga: Because the President and the First Lady live here. It's their home and they need some peace and quiet. Did you know that all the Presidents of the United States have lived here (8)? Olga: There is one exception, however: George Washington never lived in the White House. It was finished after his death. Misha: Oh, we didn't realise that. We were wrong all along. This isn't the meeting place of our four presidents. Mark: At least we know that there's no hidden treasure here, so we don't need to go in. Are there any other places in Washington that are connected with the presidents? Sure, there are lots of them. For example, look at this four-sided stone structure which looks like an Egyptian obelisk (9). It honours the "Father of our Country", General, and the first President of the United States - George Washington. Mark: And does it have any connection with Thomas Jefferson? Olga: I'm afraid not. But you can see the Jefferson Memorial in Washington too (10). It's quite a long walk from here, but we can go there if you want to. It's a very picturesque place, surrounded by cherry trees. You can see extracts from Jefferson's most famous works on the walls of the Memorial (11). Mark: That's interesting. And when was it built? Olga: It was dedicated on the 200th anniversary of Jefferson's birth, so it was opened in 1943. Rob: Oh, and what about President Lincoln? 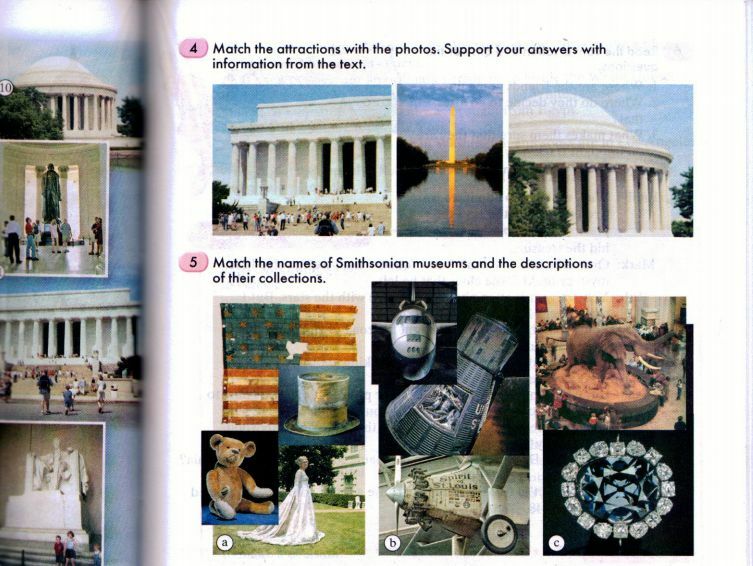 Olga: There's the Lincoln Memorial (12), with a huge statue of Lincoln in the middle (13). I personally find it the most beautiful. The Memorial looks like a Greek temple, and it has 36 columns, one for each state at the time of Lincoln's death. It's a very important symbol, because Lincoln spent his whole life trying to keep the country united. Emily: Yes, we remember the story of the war between the North and the South. Let's go and have a look at that memorial. Olga: And after that we could visit some museums. Washington takes pride in its world-class museums at the Smithsonian Institution. There is something for everyone: The Smithsonian National Air and Space Museum, the Smithsonian Natural History Museum, the Smithsonian American History Museum and many more. The museums are free and fun to visit, with a lot of guided tours and different activities. Rob: I also heard that we could visit the FBI building (14)? Olga: Well, yes, parts of it. If you're a fan of spy stories, you'll enjoy the FBI's demonstration of spy equipment and real-life stories about finding criminals and fighting terrorism. 1. You can see full-size trains and tractors, a collection of inaugural dresses from the First Ladies, the American flag, a teddy bear, Abraham Lincoln's top hat. 2. There are a lot of space rockets and a lunar landing module. It also has the original airplane used by the Wright Brothers and "the Spirit of St. Louis", the first plane to cross the Atlantic, which Charles Lindbergh flew from New York to Paris. 3. It takes great pride in its collection of minerals and precious stones. One of these is the world-famous Hope Diamond. There are also displays of prehistoric animals and their bones. 6 Read the conversation and answer the questions. 1. Where are the friends going now? 2. Where do they decide to go after that? 3. What makes them sure that they are on the right track now? Emily: Well, we have to admit we were wrong. Washington isn't the place where Robin Mac Wizard hid the treasure. Mark: Or maybe it is. We can't know for sure until we've solved the mystery of ALL the clues that he left. Rob: Yes, we've forgotten about the picture with the stars. But I remember Mark had an idea about it. Mark: I only said that I had heard about the road of stars. I think it's somewhere in California. Emily: Wait a minute! I know what you're talking about. It's in Los Angeles. 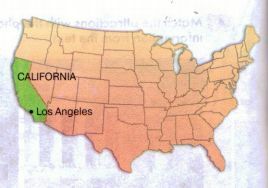 We must go to California. Misha: But it has nothing to do with our four presidents. We're going to make another mistake. And what about the hills? Emily: Oh, now I remember. There are hills there too, in Hollywood. Mark: But do they "sparkle with gold"? Emily: Of course! Don't you know the nickname for the state of California? Emily: It's called "the Golden State", because a lot of gold was discovered there in 1848. 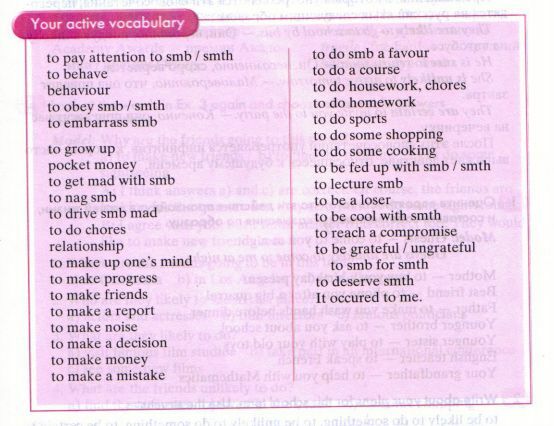 А Say if these statements are true, false or there is no information. Then correct the mistakes. If there's no information in the text, try to find out more. 1. Washington stands on the River Thames. 2. Washington isn't in any state. 3. DC stands for the District of Columbia. 4. Washington is named after the second President of the USA. 5. The District of Columbia is named after Christopher Columbus. 6. The Capitol is the tallest building in Washington. 7. In the evening Washington can look like an outdoor fitness club. 8. 1600 Pennsylvania Avenue NW, Washington, DC 20500 is the address of every American president. 9. It's not possible for an ordinary person to go inside the White House. 10. The Jefferson Memorial can be seen from the White House. 11. The Washington Monument was brought from Egypt. 12. The FBI building is in New York. 13. Some foreign embassies are in Washington and some are in Los Angeles. В Write about the capital of Russia. Include any museum or memorial you like and give a description.